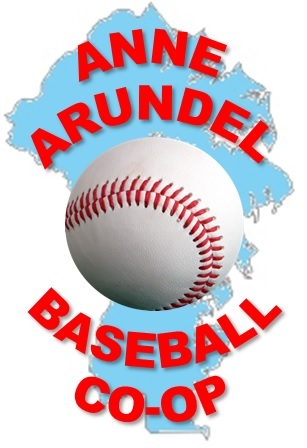 The Anne Arundel Baseball Cooperative is a league of independent youth baseball organizations that operate in Anne Arundel County, Maryland. Teams entered from the various organizations are INTRAMURAL or REC-BALL teams that would otherwise play wholly within their own community organization, and are participating in this league solely to have more teams to play during the season. This is NOT A TRAVEL OR SELECT TEAM LEAGUE! Select "The Co-op" on the main menu for more info, or send email to aabaseballcoop@gmail.com. Arden (ARA), Broadneck (BBSC), Brooklyn Park (BPYAA), Elvaton (ERA), Glen Burnie (GBBS), Greater Glen Burnie (GGBJSL), Gambrills-Odenton (GORC), Harundale (HYSL), Kent Island (KIYBSC), Lake Shore (LSYB), Linthicum-Ferndale (LFYAA), Maryland City (MCRC), Pasadena (PBC), Peninsula (PAL), Severn (SAC), Severna Park (GSPAA), South Maryland/Davidsonville (SMLL/DAA). Each organization rep or individual team managers are required to submit their team rosters by Monday April 1, 2019. Organizations may request updates to their roster using the same form, but by Monday April 15, 2019. To begin, on the main menu select Forms, then Online Forms, the Team Roster Form. Age Determination - Reminder that beginning with the 2018 Fall season and the 2019 Spring season, the age of a player in Co-op league will be determined by the player's age on AUGUST 31, 2109. This matches national youth baseball organizations such as Little League and PONY, and part of an effort to make all the divisions younger on average, and equivalent to school grade ages. For example if a player turns 11 between September 1, 2018 and August 31, 2019, that player is considered 11 years old for both this fall and next spring, and would be playing in our 11-12 year old division. Bat Rule - We will also be following the same national youth baseball organizations who have adopted USA Baseball's bat program. This is an effort to have metal and composite bats better simulate wood bat performance. Non-wood bats will have to have a USABat certification sticker. Go to www.usabat.com for a complete list of approved bats. Team managers are responsible for knowing first the GROUND RULES and the SCHEDULING POLICY (see The Co-op on the Main Menu), and then the PLAYING RULES for their specific division (see below in this section). ALL CO-OP COMPLETE ("ALL-IN") AND CROSSOVER GAMES ARE PLAYED BY THESE RULES - THERE ARE NO "HOME FIELD" RULES. Managers should print out the appropriate pages for their division and carry these with them to all games, and ask any pertinent questions at the plate conference with the umpire. Crossover games in the 8U, 10U, and 12U divisions will be between Monday May 6 and Saturday May 18. For "all-in" teams, all regular season games must be made up (or cancelled) by Saturday June 1. The Co-op tournaments will begin on or about Monday June 3, finishing on or about Saturday June 15. Organizational Reps - please assign team/manager to the team numbers for your organization. Please check dates/times/fields, and make changes as necessary based on your home field availability. Please email changes to aabaseballcoop@gmail.com. *Some mobile users are not seeing fonts and background colors properly on spreadsheet versions. The PDF version should fix that, but could also be a few hours behind the spreadsheet update. Email aabaseballcoop@gmail.com for questions. We will be having a Planning Meeting for the 2019 Spring Season, to be held on Wednesday March 13, 630pm, at the Greene Turtle in Pasadena on Magothy Beach Road.